From CitizenGo: As we approach Remembrance Day, we are reminded of the incredible sacrifices made by thousands of Canadians to secure our freedom and democracy in the great wars and conflicts of the past. But was their sacrifice for naught? Today, in 2018, we are losing our freedoms at a dizzying pace. Our new foes, however, are not armed with guns and mustard gas (for the most part). They come in the garb of political correctness. They preach tolerance and peace, but they practise hatred and suppression. Their latest handiwork can be seen in the recent arrest of an elderly priest. On October 25th, 83 year old Father Tony Van Hee was charged by Ottawa police. His crime? Defending free speech. Father Tony was quietly sitting on a stool on a public sidewalk in Ottawa carrying two signs. He was not yelling or shouting. He was not blocking the sidewalk. He was not making mean faces. 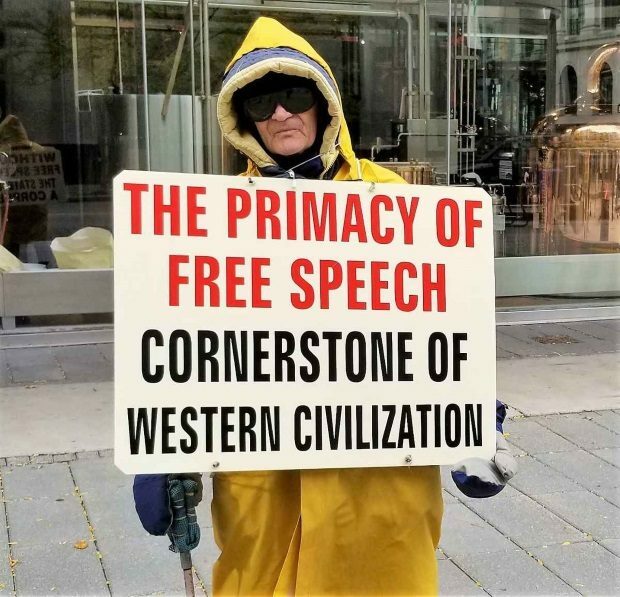 He was just carrying some signs – signs that most people would agree with. Apparently, these “dangerous” messages required armed police officers to confront the elderly priest, confiscate his signs, and charge him with violating the “Safe Access to Abortion Services Act”. It’s true about Fr. Tony Van Hee. And don’t think it won’t be you later. You haven’t reached the point yet where you are no use to the progressive elite.